Every summer we’re faced with multiple stories about people drowning in BC. Somewhere between 50 to 70 preventable deaths per year in BC alone, according to the drowning report published by the Canadian Lifesaving society. 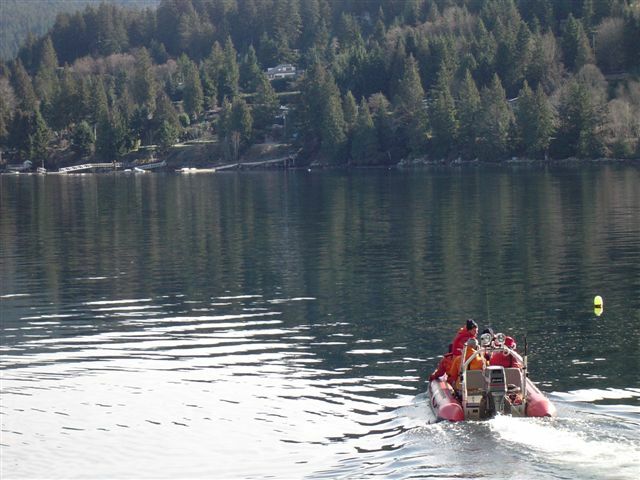 Being a ground SAR volunteer, I’m not called out for water-relatedincidents very often, but GSAR in BC also includes inland waters, and BC has some enormous lakes. However, it doesn;t take a big lake to kill you. One of the most memorable, and most tragic incidents I’ve been involved in, was at Burnaby Lake. Not your standard picture of a cold deep glacier-fed mountain lake, Burnaby lake is scarcely 6 feet deep, is very warm, and is very small at only 300-400m wide. Not Burnaby lake; for illustration purposes. The short story is this; Three kids stole a canoe one spring, and paddled out onto the lake. They tipped the canoe. Two stayed with the boat, the third tried to swim to shore which was just a few hundred feet from where they tipped. We searched for him for two days in that lake. We brought out the RCMP Dive team. I personally took the boy’s family out in our rescue boat to show his crying mother and siblings where he was last seen. His body floated up a few days later, startling rowers as they got their morning work out. When SAR is called for a water rescue it is almost ALWAYS a body recovery, and we hate that part of this job. Please wear your life jackets. PS: Drowning doesn’t look like drowning. Yup, most of my search and body recovery experience has been on the water, all losses simply preventable by wearing a PDF. I don’t hesitate to remind folks I see setting out on their kayak, fishing boat, or heaven forbid their own kids not wearing PFDS, to semi calmly let them know wearing a PDF is a good idea, and when they brush off the advice, then tell them the impact on their loved ones wondering why, why, why as we comb underwater with cameras and sonar to bring a lifeless brother, friend, daughter, son, husband home for the last time. I always ask people if they would drive their car without a seatbelt. I usually get a quizzical look in the “are you kidding? Of course not” category. I remind them that you put on a lifejacket because you don’t know when you’ll be in the water, like you won’t know when you’ll be in a car accident. If I recall correctly, I had sent an email to the Red Cross after a local SAR call, to mention that while in Iceland, I had found out that it is law there that everyone learns to swim and so is taught in schools. With the amount of water we have in Canada, I believe it should be part of the corriculum as well. Indeed, PFDs save lives. Here in my little corner of the world it’s also PFD/lifejacket season. Every year our SAR group does a PFD exchange, where people can bring in their ill-fitting or old PFDs and walk out with a newer, more appropriately fitting one. We try to put an emphasis on proper fitting for children. Last year, we did 240 PFDs. It’s a free service we do once a year as part of our PSAR (preventative SAR). Life jacket may not be the most fashionable water accessory, but they can save your life. Thanks for emphasizing their importance.